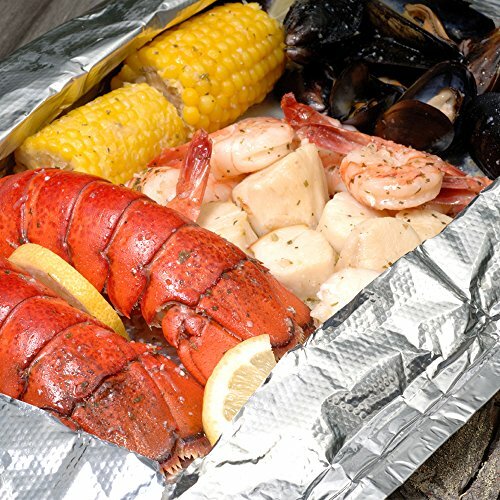 This is the ultimate lobster bake! Two lobster tails, a dozen mussels, eight shrimp, eight sea scallops and two ears of corn are all drenched in an herbed lemon butter sauce. This award-winning combination is packaged in a large foil bag that can be cooked on the grill or in your oven. This is the life-a Maine lobster bake for two without any of the work. Just thaw, heat and eat. Manufacturer: Hancock Gourmet Lobster Co. Publisher: Hancock Gourmet Lobster Co. Studio: Hancock Gourmet Lobster Co. If you have any questions about this product by Hancock Gourmet Lobster Company, contact us by completing and submitting the form below. If you are looking for a specif part number, please include it with your message.